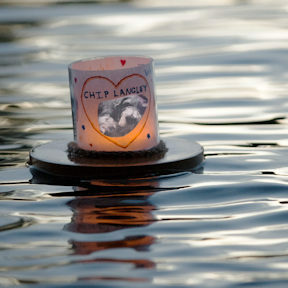 Life Cycle Pet Cremation recently organized a Floating Lantern Pet Memorial ceremony. The ceremony gave pet owners a healing way to remember their special companions. Each pet owner decorated a lantern with personal memories of their pet, and then set their lantern out to float in the lake. Taking place at dusk, the site of all the lanterns together was a moving reminder of the bonds between our beloved companions and ourselves. Life Cycle Pet Cremation is a pet-only funeral home offering customized cremation services in Whatcom County, WA. In addition to actual cremations, Life Cycle offers a wide range of products and services designed to help pet owners honor the loss of their beloved pets. Life Cycle’s owner, Bobbie Ruth Langley, is one of the most compassionate people I know. Her compassion eases the process of letting go of one’s dearest friend.